The meaning of Thoth’s name (“DHwtii” or “Djehuti”) is lost. 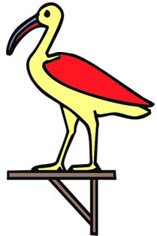 He is represented by the hieroglyph of the Ibis on a standard (Ibis religiosa). In Babylon, he was called “Tichut”. Some proposed “he of Djehout” (an unknown city), but Hopfner (1914) believes “DHw” was the oldest name of the Ibis (“hbj”). Thoth would then mean “he who has the nature of the Ibis”. As early as the Pyramid Texts (ca. 2400 BCE), Pharaoh is said to be carried over the celestial river on the wings of Thoth, considered to be the mightiest of the gods. 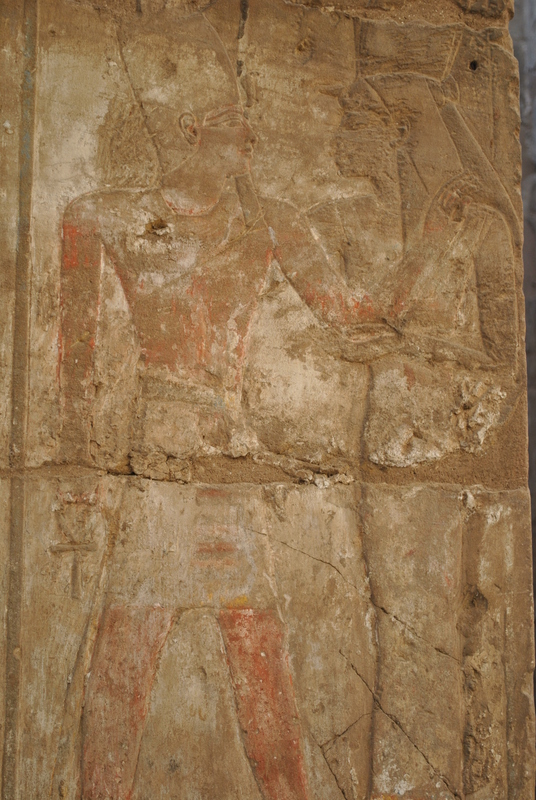 From the early 3th century BCE, the epithet “Thoth great, great, great” (“DHwtii aA, aA, aA”) is found at Esna in Upper Egypt, whereas the expression “Thoth the great, the great, the great” (“DHwtii pA aA, pA aA, pA aA”) is part of Demotic texts outside Memphis, dating from the early 2nd century BCE (cf. the Greek “Hermes Trismegistos”). Other writings suggest a link between Hermetism and the cosmology of Hermopolis (and its Ogdoad). Another, less common, pictogram for Thoth was the squatting baboon, who greeted the dawning Sun with cries of jubilation. The religion of Ancient Egypt has been reconstructed by the Greeks (in the Hermetica), by the Abrahamic tradition (in their Scriptures) and by the Western Mystery Tradition (Hermeticism). But these reconstructions are flawed. The Hermetic teachings incorporate an un-Egyptian view on the mysteries (stressing the mind at the expense of the body). The protagonists of the revealed religions (Judaism, Christianity & Islam), as well as the initiators of Hermeticism, were unable to read the hieroglyphs, and if they did, only allegorical, explaining the obscure with more obscurity. Only the last two hundred years has a reliable historical reconstruction become available, offering a basic historical framework. Not the Qabalah (Jewish or Christian), but the Ancient Egyptian Mystery Tradition (or Kemetism) is the backbone of the Western Tradition. Instead of Hermeticism, a return to Hermetism is invisaged. To approach Kemetism today, ten Hermetic principles are isolated. Each is associated with a fundamental teaching found in Egyptian texts. This exercise is possible because the Hermetica are rooted in the native Egyptian religion, albeit Hellenized. The authors were Egyptians still able to read the “words of the gods”. 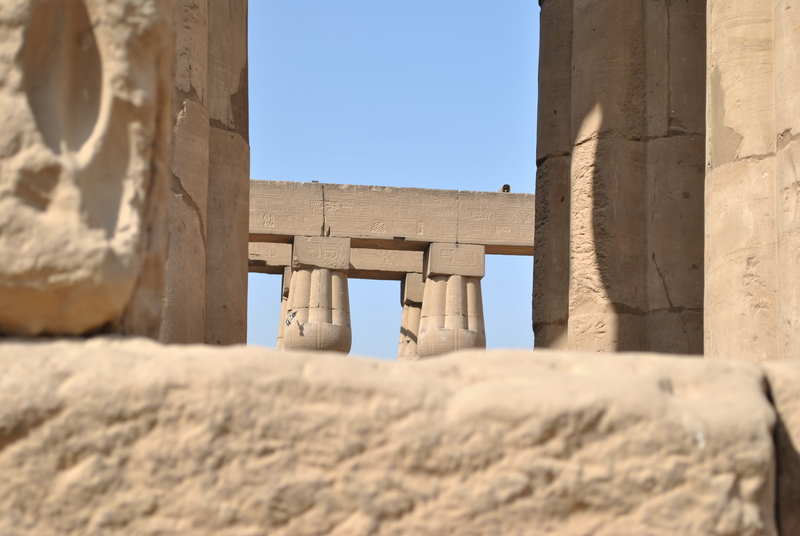 In this way, the Western Tradition may finally stretch its roots in perennial soil, first in Alexandrian thought and from there in the native Egyptian tradition, its natural ally. literary Hermeticism : Renaissance Hermeticism produced a fictional Trismegistus as the Godhead of its esoteric concept of the world as an organic whole, with an intimate sympathy between its material (natural) and spiritual (supernatural) components. This view was consistent with the humanistic phase of modernism, which was followed by a mechanization of the world and the “enlightenment” of the 18th century. These new forces ousted all formative & final causes from their physical inquiries, and reduced the four Aristotelian categories of determination (material, efficient, formal and final cause) to material & efficient causes only. Astrology, magic and alchemy were deemed scientifically backward & religiously suspect. “Actio-in-distans” was deemed impossible, and Paganism was Satanical. In 1666, Colbert evicts astrology from the Academy of Sciences (the court-astrologer Morin de Villefranche, 1583 – 1656, was concealed behind a curtain in the royal apartment at the time when the future Grand Monarque was born). In the nineteenth century, under the influence of the morbid but exotical fancies of the Romantics, Hermeticism became part of Rosicrucianism, Freemasonry, Theosophy and generalized egyptomania (cf. Golden Dawn, Thelemism, Pyramidology, etc.). Today it returns as the ideological core of the expanding New Age religion. “Nu”, “nw” with D6, the determinative for action with eyes. Keep guard over, watch, look, tend, guide, care for, shepherd. Incidentally, the adze was used in the “Opening of the Mouth”. On the one hand, according to Stricker (1949), the Corpus Hermeticum is a codification of the Egyptian religion. Ptolemy I Soter (304 – 282 BCE) and his son Ptolemy II Philadelphus (282 – 246 BCE) promised to publish the secret literature of the three groups of citizens of Egypt : native Egyptians, Greeks and Jews. For him, Hermetism is the Greek version of a redaction of Egyptian literature. Its form is Greek, but its contents is Egyptian (the Septuagint being the equivalent Jewish redaction). On the other hand, father Festugière (1945) claims the CH contains extremely little Egyptian elements, except for the context, the ideas expressed being those of popular Greek thought, a mixture of Platonism, Aristotelism and Stoicism … Both positions are avoided. Most agree the CH contains no Christian elements (the opposite is true – cf. the influence of Philonic thought in particular and Alexandrian philosophy in general on the apostle Paul – Quispel, 1992). Let us conjecture the emergence, under the first three Ptolemies, of a Greek elitist version of the Egyptian religion, a Graeco-Egyptian religion, and this among the upper native classes (of priest, scribes, administrators & high-skilled workmen). This Graeco-Egyptian religion would be based in Alexandria and Memphis, and (at first) entail a strong emphasis on the native component. It emerged in the priestly scribal class and had its focus on Thoth, who created the world by means of his Divine words, in accord with the verbal tradition founding Egypt. 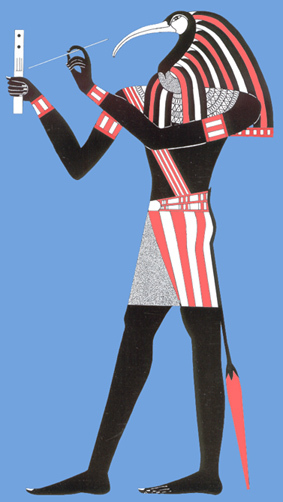 For the Greeks, Thoth was “Hermes, Trismegistos”, indicative of both his antiquity and greatness. 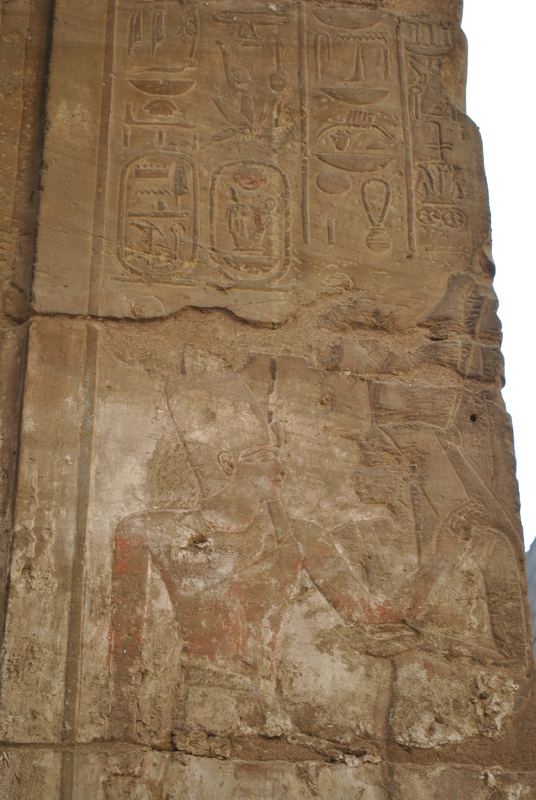 Because of the important influence of the native intellectual milieu on the genesis of this Alexandro-Egyptian cultural form, “Graeco-Egyptian religion turns out to be based on a profound imbalance, in favour of the autochthonous, between its two constituent elements.” (Fowden, 1986, p.19). Zandee (1992, p.161) mentions a Hermetical text going back to the third century BCE and for Petrie (1908) at least some passages of the Corpus Hermeticum had to refer to the Persian period … This feature proves to be essential in a possible thematical reconstruction. But, the Hellenization entailed by using the Greek language and participating in the syncretic Alexandrian intellectual climate (the Mouseion and Serapeion), should not be underestimated, and makes Stricker’s proposals too unlikely. These native Egyptians must have been proud of their Hermopolitan & Memphite theologies (both verbal & scribal), but eventually accepted to incorporate uncompromisingly un-Egyptian elements in their Hermetism (like the popular Greek denial of the physical body, evasive mysteries and an elusive, vague description of the afterlife). The importance of the Netherworld is no longer felt. Many other Greek themes are to be found in the Corpus Hermeticum, showing Festugière was not completely wrong. In a study of Zandee published in 1992, the Egyptian influence was confirmed, although besides the negative view on the body, he also identified the depreciation of the world, the celestial voyage of the soul (or mystical initiation – cf. 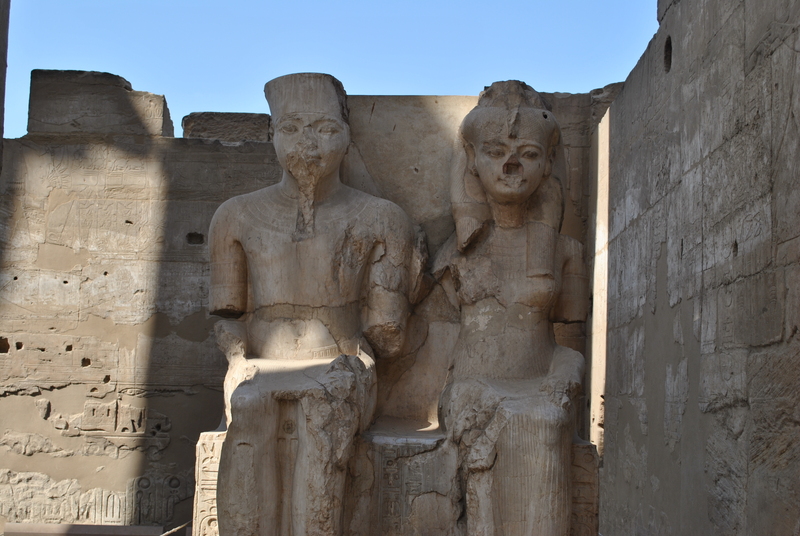 Mahé, 1992) and reincarnation as Hermetic teachings not to be found in Ancient Egypt. To this list could be added the Hermetic variant of the Greek mysteries and magical techniques aimed to compel the will of the gods (impossible in Ancient Egypt). Indeed, the difference between Egyptian initiation and Greek mysteries is pertinent (the attitude of the worshipper as well as the responsiveness of the deities differ). We may argue that the technical Hermetica are rooted in perennial Egyptian traditions like magic (“heka”) and the “books of Thoth”. It is probable that, at least insofar as medicine & magic were concerned, this indeed was the case ? The philosophical Hermetica also share certain features with the Egyptian wisdom-discourses or instruction genre. Hermetism is not a “Sammelbecken” (heterogeneous doctrines), nor a single synthesis, but an autonomous mode of discourse, a “way of Hermes” (Iamblichus), more theological than philosophical (like Plotinus, who -compared to Plato- was more religious than political) and foremost (in number) “technical” : astrology, magic & alchemy. This Graeco-Egyptian religion was influenced by three major players : the Greeks, the native Egyptians and the Jews. It could define its own path precisely because of its roots in the Ancient Egyptian Mystery Tradition, to which most of its members adhered. In its mature stage, Hermetism manifested the religion of the mind (“religio mentis“) of Mediterranean Antiquity. This Late Hellenistic Hermetism would survive and eventually fire the European Renaissance and humanism. But the “ad fontes” principle of the latter only returned to Late Hellenism. Antiquity would remain unavailable for several centuries. Not unlike Spinoza’s “amor intellectualis Dei“, philosophical Hermetism gave body to an intellectual love for the One, albeit in modo antiquo, and never without magic & alchemy. In the 17th century, this technical side was left behind by the European academia, whereas the philosophical Hermetica became part of Hermeticism and its various branches. The “gnosis” of Hermetism (the secret it shared through initiation) was an ecstasy born out of cognitive activities, involving trance, contemplation, ritual, music and astrology. In Hermetism, astrology served as the bridge between the purely technical Hermetica -magic, medicine- and the theological & philosophical Hermetica. Astrology was concerned with the timing of events, both festive, initiatory or individual. The Corpus Hermeticum and the Graeco-Egyptian religion of which it was the chief extant codification, was a spiritual way in its own right. Alexandrian Hermetism was a mixture of Greek thought with genuine Egyptian religious traditions. Scholars have pointed to the reverence for the creative word, the magical power of divine statues, the wisdom literature, the bi-sexual nature of god, the one and the many, the Sun as creator, the cosmos as an ordered whole and also noted Jewish components and imagery. In this paper, other important Egyptian themes will be put forward.